The Bank for Foreign Trade of Viet Nam (Vietcombank), Da Nang branch and the Son Tra Joint Stock Company (Son Tra JSC) jointly signed a credit contract of VND240 billion (more than US$14 million) to invest in the five-star Son Tra Resort & Spa on September 18. The 500-room resort will be built on the area of over 14 ha, along the 1.6km long coastline of Bai Nam beach, including a 100-room hotel, a 800-seat conference hall, a floating restaurant, a kindergarden, tennis courts, a mini golf-course, French architectural style villas and bungalows on cliff, etc. 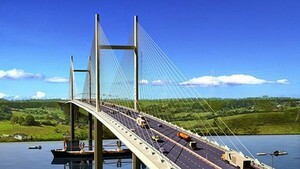 The total invesment capital of VND600 billion (US$36 million) is divided into three periods. The fisrt period will be completed at the end of 2007. Son Tra peninsula, located far from 10-km northeast of the Danang City on area of 4,440 hectares, is home to various kinds of valuable and rare plants and animals. With coral and beautiful beaches, Son Tra is a potential place to develop the water sports such as sea diving, stream bathing, fishing, and so on.